Why use business cards in this digital age when it seems that everyone, from toddlers through grannies, has a digital device in their hands or pressed to their ears? Isn't the traditional business card superfluous or at least old-fashioned? Well, no. Here are seven reasons why you should still bother to get business cards printed for your small business and hand them out. It's true that some digital devices, such as Android phones or iPhones, allow information to be beamed from one phone to another, but only from one compatible phone to another. The chances of all your potential customers having the same kind of phone are extremely remote, making business cards once again the better option. I know! How do they manage to struggle through each day? But I personally can vouch for the fact that there are still plenty of people who still do not own a smartphone, (or if they do don't always carry it around with them). I even know of some that have computers in their homes but don’t use them on a regular basis. If you want to sell things to some of these people, business cards can help. They're never inaccessible because of dead spots or Internet outages. You can use them at a remote fishing camp or at an industry conference in the mid-city hotel - or even in situations where cell phones and other digital devices might need to be turned off, such as on planes or in hospitals. People want to deal with businesses that they feel are trustworthy. When faced with businesses that don't have well-known names or long-established reputation that they haven't dealt with before, they judge a business on its appearance (and what other people say about it). Having acceptable looking business cards is one way that you cue people that you are running a real business and will do right by them. Obviously, you promote your small business when you hand out a business card; you're hoping that the person you're giving it to will use the information on the card to contact you. But why stop there? Turning your business card into a brochure lets you tell the prospective client or customer why she should call you, too, all on one card. Or take it a step further and turn your business card into a promotional item that will serve as a visible daily reminder of your business. 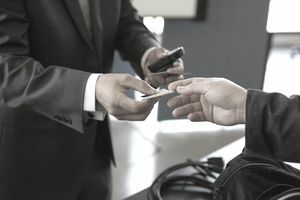 The ritual exchange of business cards is central to establishing business relationships in many countries. In Hong Kong, for instance, if you are given a business card and don't offer one in return, you can basically close up business then and there, says Rory Boland in Hong Kong Business Card Etiquette. In Japan, too, the quality and condition of your business card speaks much about how you intend to conduct yourself and business. A lot of business networking happens virtually these days. But while virtual or online networking has expanded business people's networking circles, it hasn't superseded the face-to-face networking that has long been the tried and true method for creating business relationships, finding business opportunities, and increasing sales. And business cards play an important role at these functions. Here are 22 Tips to Use at Your Next Networking Event, including tips on how to use your business card most effectively. Why use business cards? Because the old-fashioned paper rectangle is still the fastest and easiest way to share business contact information with other business people and with prospective customers and clients. Even in this digital age, they're still one of the best ways to remind people about your small business – and therefore, to get business.